At the very south end of the Strip sits the beautiful and shining Mandalay Bay. The theme of Mandalay Bay Hotel Las Vegas is tropical elegance mixed with hip, chic, eclectic vibes. Around every corner, excitement and new discoveries await. Mandalay Bay Hotel offers restaurants that will surely stir your taste buds. There is Aureole, complete and equipped with a wine tower and angel who goes up with cables to retrieve your wine, Trattoria del Lupo, the southwest flavors of Border Grill, House of Blues, and Fleur de Lys. Although not keying on big name chefs, the restaurants surely boast big flavors and quality dining. For the adventurous, there is the Shark Reef aquarium attraction where you can get up close and personal with octopus, fish, and sharks. In total, the Shark Reef features over 100 species of animals. Truly an educational experience, you will not find another one like it in Las Vegas. 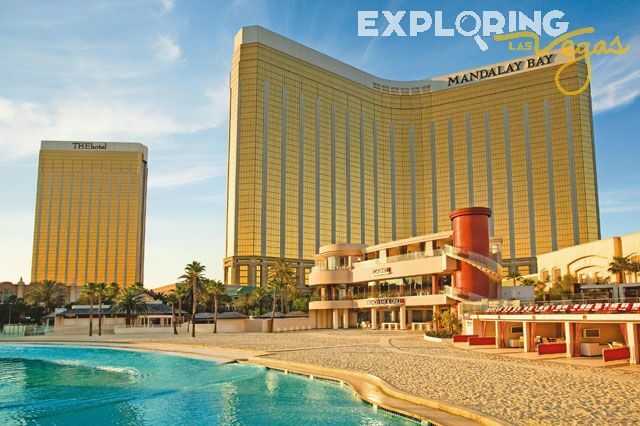 Mandalay Bay Hotel Las Vegas also boasts the only wave pool complete with a sandy beach on the Las Vegas Strip. If you don’t ride waves, then you can happily float along in the lazy river which goes around the perimeter of the pool area. Nightlife can be found at Rumjungle – a restaurant by day and a night club and hip social scene by night – complete with beautiful go-go dancers. The newest addition to the Bay is THEhotel. With contemporary sophistication, THEhotel also offers the impressive Mix Lounge which is located on its top floor. For those who wish to stay on ground level, Mandalay Bay offers Ivan Kane’s famous Forty Deuce burlesque club which features dancers who move to the beat of old school jazz. While staying within its overall theme of tropical delights, the hotel has fused a perfect marriage of ingredients that will surely accommodate any one who steps foot on this wonderfully stylish property. Beauty salon, laundry service, luggage service, wedding, golf, beach, spa, meeting spaces, convention services, catering, VIP concierge. Shopping : Jack Gallery, Jungle Juice, Logo Store, MAMMA MIA Store, Mandalay Bay Las Vegas The Store, MM Memorabilia Museum, Pearl Moon, Rangoon News Bureau, Shark Reef Shop, Surf Shack, Shark Reef Huts, Tropical Gifts & Stuff, THEstore in THEhotel, The Wave. Table Games : Baccarat, Blackjack, Craps, Let It Ride, Pai Gow, Pai Gow Poker, Roulette, Three Card Poker, Texas Hold'em, Seven Card Stud, Poker Tournaments, Slot Games. Slots, Race and Sports Book (17 large screens, 300 seats), High limit room (European Roulette). Mix Lounge, Ivan Kane's Forty Deuce, the lounge, j-pop Lounge, Orchid Lounge, Island Lounge, House Of Blues, Fleur de Lys, Aureole, China Grill, Shanghai Lilly, Red Square, Trattoria Del Lupo, Rumjungle nightclub, restaurant rm, STRIPSTEAK. Ultimate Fighting Championships, world championship boxing, Bob Dylan, B.B. King, Sheryl Crow, Mamma mia show, shark reef (sharks, sawfish, stingrays, turtles, piranha, crocodiles and more), Mandalay beach. The Mandalay Bay Hotel. I like the mandalay bay very much. It has a very very nice pool (the voted best in Las Vegas) with wafe simulator .. not bad not bad. The Mandalay bay has also a big shark reef wich you can see a lot of fishes ... I think everyone should see it .. my opinion ! GREAT!